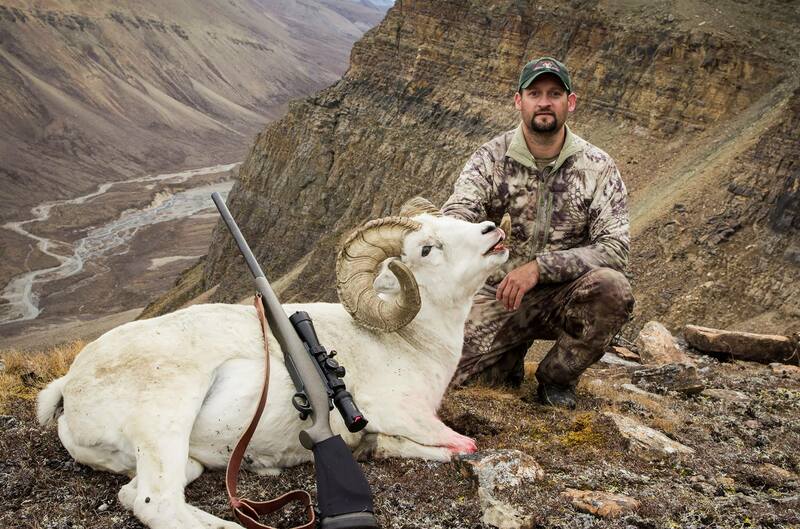 This ram was bedded on a ledge approximately ¾ of the way up the mountain. There was only one way to approach him and unfortunately the route took me straight up the cliffs below the ram. Of course, the path included loose shale slides and some near vertical walls. What sheep hunt doesn’t? Trying to stay quiet on steep shale slides was slow going. During the last portion of the stalk I knew I was within range of the ram, but I couldn’t see him above the cliffs between us. Any sound and the ram would surely escape over the top of the mountain before I could get high enough to see him. The last portion of the stalk took me over two hours, quietly moving rocks out of the way by hand for each step. During the final leg I had to place the rifle up on rock shelves above me multiple times and inch my way up rock crevasses. In a couple places, I was only feet away from the 100+ foot vertical drops that stopped any approach from the flanks of the ram’s location. Thank God that PROOF rifle is as solid as they come. I’m sure that the ram believed nothing could scale those cliffs below him, because when I reached the top, the ram was unaware, bedded and facing away at only 25 yards. At this point I was sure I had him, but the roll of the hill prevented me from seeing his chest area. I had to get even closer. Slowly, I moved up and reached a flat rock that elevated me enough to see the entire sheep still bedded in front of me. He was so close that even when I turned my Vortex HLR scope down to 4X he still filled the entire view. He was only 15 yards away. At this range an offhand shot was pretty simple and the ram never stood from his bed. Even before the echo of the shot had faded down the canyon my shouts of excitement were resonating back.